Disclosure: Boston Mamas is delighted to take part in the 3rd annual Back to Ski Week as a compensated editorial partner. Back to Ski includes tips on planning a family ski vacation as well as chances to win prizes. To learn more visit the Back to Ski site and sign up for the newsletter, follow @back2ski on Twitter, or like it on Facebook. Have assumptions about cost scared you off of exploring winter sports? Today, Emily Bradbury, mother of two ripping little snowboarders + blogger at Adventure Travel Mom shares why winter mountain sports are great -- and also can be affordable! -- for families. Did you know that fifth graders can ski or ride for free in Vermont, no matter where they live? Or that in January you can take a lesson and get rental ski or snowboard equipment for only $29? Emily makes a persuasive case for taking your family to visit Vermont’s mountains! It’s impossible for me to see the first red leaves of fall in Vermont without anticipation for the coming ski season. The boys have already pulled their boards out of storage, and it’s only a matter of weeks before we see the first snow on top of Mt. Mansfield. From the first runs on the bunny slope as a toddler, to the parks and glades as teens, and later the simple enjoyment of a perfect groomer, you don’t outgrow skiing and riding. There are people here in Stowe who have been skiing for more than 50 years, and still log more runs each season than I do. In an era of too many screens and too many obligations, the mountain is a place of freedom, friends, family, exercise, and joy during the winter months. It’s pretty funny to hear 8-year-olds bragging about “using their edges,” but it’s true that kids learning to ski and ride in Vermont will experience a variety of terrain and conditions and learn to ski in all of them. Perhaps that's why Vermont sent more athletes per capita to the winter Olympics last year than any other state! One piece of advice: start them with good instruction. January is Learn to Ski & Snowboard Month and it's the perfect time to take a lesson since first time skiers and riders of any age can do so for $29…and that includes your lift ticket AND rentals! A great coach will break down form and technique to really help a beginner have a positive experience. Tired muscles, rosy cheeks, and little bodies filled with fresh mountain air...what's not to love? For a small state, Vermont has no shortage of mountains to explore each with its own reputation and special terrain. The Fifth Grade Passport program offers students in the fifth grade a season of free skiing and riding at Vermont resorts. I repeat, free skiing and riding at Vermont resorts! To be even more specific, 88 days of free skiing and riding at both alpine and Nordic areas! The only catch to this program is that there is a limit to the number of times you can ski at each resort, but that just means more terrain to check out. 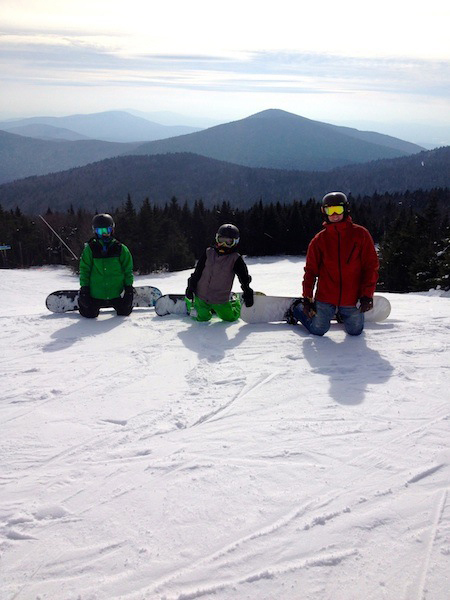 Last year, my family took weekend trips to Mount Snow and Killington and found that we really enjoyed the variation from our home mountain. At 9 and 11, my snowboarding boys are into parks, and each mountain had some really fun and unique features for them to explore. I truly believe that the time and energy we’ve devoted to getting our kids up on the mountain and the investment we’ve made in good instruction have been the foundation for a soul-deep love of winter and a true passion for snowboarding that they will bring with them for the rest of their lives. Bring on winter Mother Nature, we’re ready for #Back2Ski! And for more information and tips about family skiing in Vermont, be sure to check out the All Mountain Mamas website.